If you need an automobile that has best-in-class towing capabilities, the Dodge Durango is worth considering. This vehicle can pull hefty trailers, large boats, and other bulky equipment with ease because the V6 engine can support up to 6,200 pounds. A V8 engine is also available with certain Dodge Durago trims. As this engine generates power in order to effectively transport cargo, the 5.7 liter HEMI V8 provides 360 horsepower. 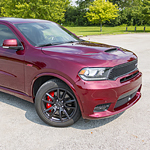 The V8 hardware gives the Dodge Durango a 7,400 pound towing capacity, which is enough power to haul heavy cargo efficiently without decreasing the engine's overall gas mileage. While operating the Dodge Durango during a towing routine, you won't experience any handling problems while traveling to various destinations since the automobile can be equipped with a practical drive system. Each all-wheel drive system is unique, and Dodge offers these options with specific engines. No matter what drive system you select, the Dodge Durango will provide professional handling and solid traction throughout various trips on different terrains. By taking a test drive, you can experience the Dodge Durango's performance features on the road. At Riverland Chrysler Dodge Jeep, there are convenient test drive opportunities for locals in Laplace, LA. If you want to schedule a session, visit our dealership today.